Aruba offers some of the finest offshore locations to experience the island's small coral bays and vibrantly colored fish. Beginners and experienced snorkelers alike will love the experience. Nice boat, friendly crew. No complaints! Would use them again! Fun day on a catamaran. To many catamarans and people not enough fish. The catamaran was so fun as were the snorkeling stops. Catamaran was great and staff was awesome. Catamaran was great and staff was awesome. Current was strong so snorkeling was difficult. Truly enjoyed this excursion!! Snorkeling area was in shallow (4 ft.
Snorkeling area was in shallow (4 ft. deep) water, and wind/waves made it rough enough that my wife gave up after only 10 minutes. This outing would be more suited th families with younger children. Recommend Full Throttle, but ONLY IF you enjoy going fast on a small boat. Recommend Full Throttle, but ONLY IF you enjoy going fast on a small boat. Back problems? I&apos;d avoid this then. Great morning tour. Loved the rum punch and the crew. Sail Aboard the Mi-Dushi was great. Sail Aboard the Mi-Dushi was great. Three different sites along with lunch. Wind made for a rough 2nd site. You really need to know how to swim for 2nd site. This was our first time booking through cruise line and not directly. Snorkeled in a couple of great spots including the sunken German ship. Snorkeled in a couple of great spots including the sunken German ship. Had fun. Did the Catamaran sail/snorkeling tour. The Black Pearl sunset cruise was super chill and relaxing. 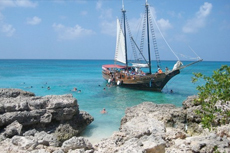 Snorkeling in Aruba: We booked Sailaway tours and were looking forward to a great day. Went catamaran sailing and snorkeling with Pelican, was a great trip overall. Aruba De Palm lsland Beach and Snorkel. Excellent trip on a Catamaran all the punch you can drink but after snorkeling - good move. Private island, reef and lagoon dive was incredible!!! Absolutely loved this snorkeling excursion, which took us to 2 sites.